Fall is rapidly approaching, and with it is the appropriate planting time for a cover crop in walnuts. The most successful cover crops for Sacramento Valley no-till walnuts are annual reseeding cover crops. Annual reseeding cover crops are planted initially in the fall and managed during the early spring until early summer to allow plants to naturally reseed. Once seed has fully matured in early to mid-June, the cover crop is mowed. If managed properly, the cover crop will re-seed annually and re-establish the following fall and winter so costs incurred will only be the initial seed and planting costs. The benefits of cover crops include increased winter orchard access, weed suppression, and fixing nitrogen (if legumes are used). September-November (left image): Seeds are planted in the fall after harvest, and buried between 1/4 and 1/2 inch deep. October-January (center image): Seedlings should emerge within two weeks and grow very slowly as the weather and soil cools. February-March (right image): Mow to about 2″ high in the early spring for frost protection and to reduce competition for clovers. Be sure not to leave a smothering mulch on top of the growing cover crop. From Orchard Cover Crops, November, 2009. March-April (left image): The cover crop should become quite dense in the spring and may look overgrown. Resist the urge to mow too early. 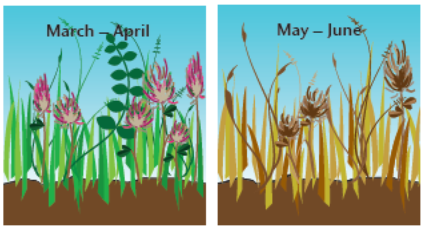 May-June (right image): Late in the spring, the cover crop will set seed and die down. It is safe to mow when clover seeds have hardened and grass seed has matured. From Orchard Cover Crops, November, 2009. For fall-seeded cover crops, the best results are achieved with earlier planting dates. Any time in October to early November is suitable for planting a cover crop in mature orchards in the Sacramento Valley. December is too late because soil temperatures are too low to provide consistent germination and competition from resident vegetation becomes more of a problem. Plan to seed just after harvest but before significant leaf fall for best stand establishment. A cover crop can be planted in young non-producing walnuts in October. For more information on cover crops in walnuts, including planting methods and cover crop mixes that have worked well in this area, please see: Cover Crops for Walnut Orchards (UC ANR publication), and Planting a Successful Annual Reseeding Cover Crop.